Photo credit: Adapted by WhoWhatWhy from Marines / Flickr. Would you be shocked to learn that the FBI apparently knew that some organization, perhaps even a law enforcement agency or private security outfit, had contingency plans to assassinate peaceful protestors in a major American city — and did nothing to intervene? 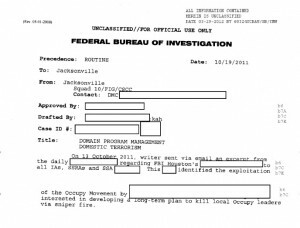 Would you be surprised to learn that this intelligence comes not from a shadowy whistle-blower but from the FBI itself – specifically, from a document obtained from Houston FBI office last December, as part of a Freedom of Information Act (FOIA) request filed by the Washington, DC-based Partnership for Civil Justice Fund? To repeat: this comes from the FBI itself. The question, then, is: What did the FBI do about it? Remember the Occupy Movement? The peaceful crowds that camped out in the center of a number of cities in the fall of 2011, calling for some recognition by local, state and federal authorities that our democratic system was out of whack, controlled by corporate interests, and in need of immediate repair? That movement swept the US beginning in mid-September 2011. When, in early October, the movement came to Houston, Texas, law enforcement officials and the city’s banking and oil industry executives freaked out perhaps even more so than they did in some other cities. The push-back took the form of violent assaults by police on Occupy activists, federal and local surveillance of people seen as organizers, infiltration by police provocateurs—and, as crazy as it sounds, some kind of plot to assassinate the “leaders” of this non-violent and leaderless movement. Kennedy knows first-hand the extent to which combined federal-state-local law enforcement forces in Houston were focused on disrupting and breaking up the Occupy action in that city. He represented seven people who were charged with felonies for a protest that attempted to block the operation of Houston’s port facility. That case fell apart when in the course of discovery, the prosecution disclosed that the Occupiers had been infiltrated by three undercover officers from the Austin Police department, who came up with the idea of using a device called a “sleeping dragon” — actually chains inside of PVC pipe — which are devilishly hard to cut through, for chaining protesters together blocking port access. The police provocateurs, Kennedy says, actually purchased the materials and constructed the “criminal instruments” themselves, supplying them to the protesters. As a result of this discovery, the judge tossed out the felony charges. WhoWhatWhy contacted FBI headquarters in Washington, and asked about this document—which, despite its stunning revelation and despite PCFJ press releases, was (notwithstanding a few online mentions) generally ignored by mainstream and “alternative” press alike. 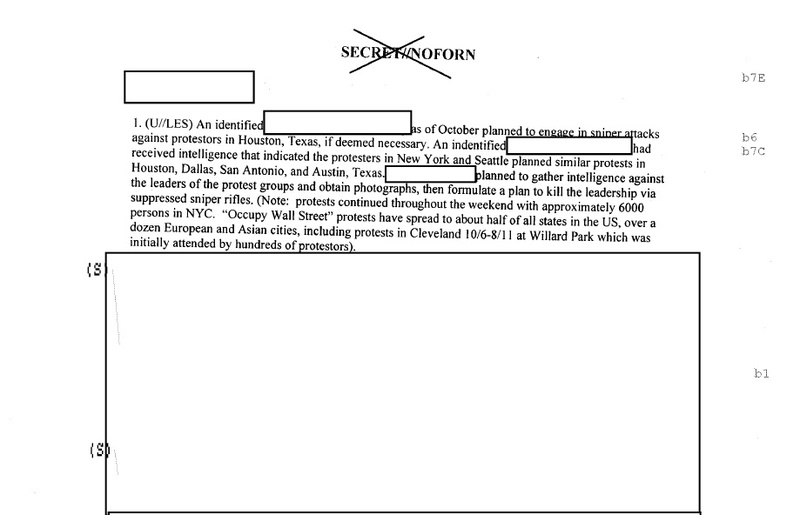 On 13 October 20111, writer sent via email an excerpt from the daily [DELETED] regarding FBI Houston’s [DELETED] to all IAs, SSRAs and SSA [DELETED] This [DELETED] identified the exploitation of the Occupy Movement by [LENGTHY DELETION] interested in developing a long-term plan to kill local Occupy leaders via sniper fire. The FOIA documents that you reference are redacted in several places pursuant to FOIA and privacy laws that govern the release of such information so therefore I am unable to help fill in the blanks that you are seeking. Exemptions are cited in each place where a redaction is made. As far as the question about the murder plot, I am unable to comment further, but rest assured if the FBI was aware of credible and specific information involving a murder plot, law enforcement would have responded with appropriate action. Note that the privacy being “protected” in this instance (by a government that we now know has so little respect for our privacy) was of someone or some organization that was actively contemplating violating other people’s Constitutional rights— by murdering them. That should leave us less than confident about Bresson’s assertion that law enforcement would have responded appropriately to a “credible” threat. 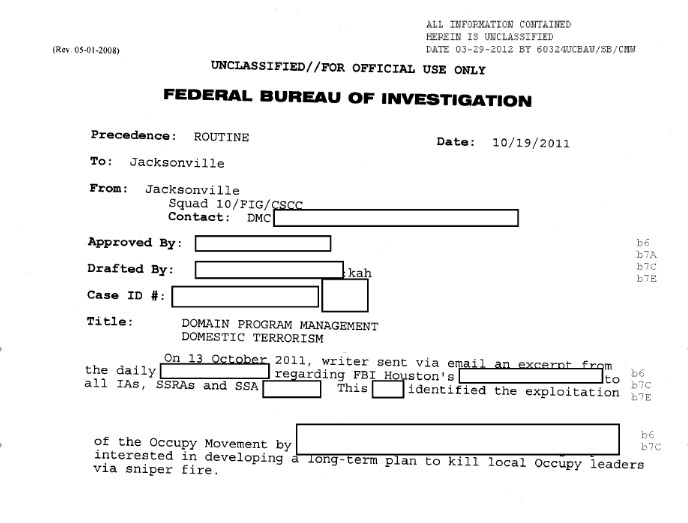 The Houston FBI office stonewalled our requests for information about the sniper-rifle assassination plot and why nobody was ever arrested for planning to kill demonstrators. Meanwhile, the Houston Police, who had the job of controlling the demonstrations, and of maintaining order and public safety, displayed remarkably little interest in the plot: “We haven’t heard about it,” said Keith Smith, a public affairs officer for the department, who told us he inquired about the matter with senior department officials. Sniper action by law enforcement officials in Texas would not be anything new. Last October, a border patrol officer with the Texas Department of Public Safety, riding in a helicopter, used a sniper rifle to fire at a fast-moving pickup truck carrying nine illegal immigrants into the state from Mexico, killing two and wounding a third, and causing the vehicle to crash and overturn. It turns out that Border Patrol agents, like a number of Texas law enforcement organizations, had been receiving special sniper training from a Dallas-based mercenary-for-hire organization called Craft International LLC. It seems likely that Houston Police have also received such training, possibly from Craft, which has a contract for such law-enforcement training funded by the US Department of Homeland Security. I assume I would have been one of the targets, because I led a few of the protest actions, and I hosted an Occupy show on KPFT. I wish I could say I’m surprised that this was seriously discussed, but remember, this is the same federal government that murdered (Black Panther Party leader) Fred Hampton. We have a government that traditionally murders people who are threats. I guess being a target is sort of an honor. probably developed in the Houston Fusion Center (where federal, state and local intelligence people work hand-in-glove). During our trial we learned that they were all over our stuff, tracking Twitter feeds etc. It seems to me that based on the access they were getting they were using what we now know as the NSA’s PRISM program. 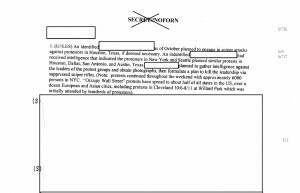 He notes, correctly, that in documents obtained from the FBI and Homeland Security by the PCJF’s FOIA search, the Occupy Movement is classed as a “terrorist” activity. Ironically, while the Occupy Movement was actually peaceful, the FBI, at best, was simply standing aside while some organization plotted to assassinate the movement’s prominent activists. 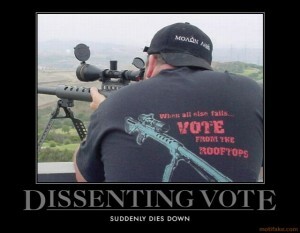 The FBI’s stonewalling response to inquiries about this story, and the agency’s evident failure to take any action regarding a known deadly threat to Occupy protesters in Houston, will likely make protesters at future demonstrations look differently at the sniper-rifle equipped law-enforcement personnel often seen on rooftops during such events. What are they there for? Who are the threats they are looking for and potentially targeting? Who are they protecting? 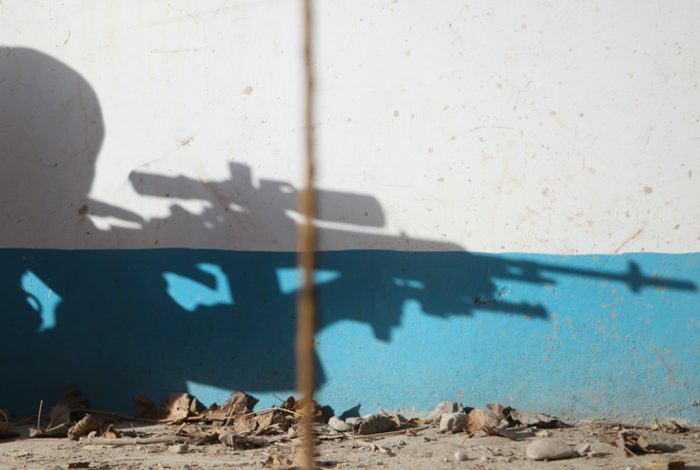 And are they using “suppressed” sniper rifles? Would this indicate they have no plans to take responsibility for any shots silently fired? Or that they plan to frame someone else? Correction: This article has been revised to reflect a correction. Chris Kyle was a Navy SEAL sniper; he was not with the Army. There are 207 comments Our Comment Policy: Keep it civilized, keep it relevant, keep it clear, keep it short. Please do not post links or promotional material. We reserve the right to edit and to delete comments where necessary.